It has been (give or take) a year since I announced my last set, Anorost. I had planned its successor to be released ~6 months after, but things happen. Nevertheless, I persisted, and I now feel comfortable sharing Divided Destiny, Set 2 of 2 of the Anorost block. 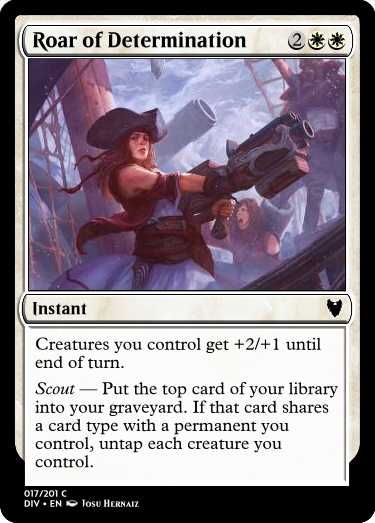 Scout -- Put the top card of your library into your graveyard. 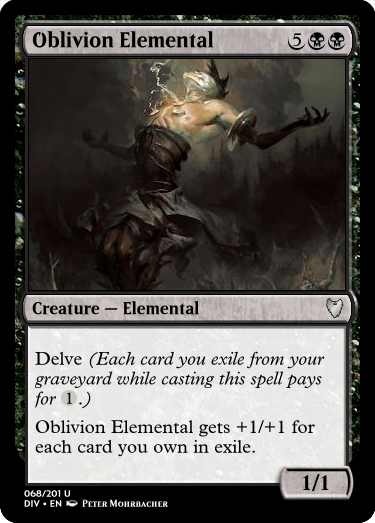 If that card shares a card type with a permanent you control, <effect>. Stay tuned for spoilers and story snippets and mechanic spotlights! Wilson marked another notch in the bark of the palm tree whose texture he had come to know so well. That marks the beginning of week four, he thought to himself.Despite all odds, I'm not doing too bad, considering. For the past three weeks, after his disastrous encounter with Maxwell's army and his spell-induced whirlwinding into the unknown, Wilson had covered every inch of the isle he had been stranded on, fashioned a makeshift camp, and foraged enough food and tools to survive. Who knew doing chores in the old Wildbore village would ever prove to be useful?, he reminisced. There wasn't a day that I wouldn't groan about going and gathering berries in the woods. CAW, CAW! The sound of a bird flapping past broke Wilson out of his reverie. Day twenty-two, he thought. That means it's time to get this thing out on the water. He slapped his hand on the makeshift bow of a wooden raft he had spliced together using boards from the shipwreck that had managed to follow him as well as sticks, leaves, vines, and anything else that he had deemed ship-worthy. Just gotta put on the finishing touches and we're good to go. His plan was a simple one. In the same manner in which he had explored the island he had been stranded on, Wilson intended to circle out until he found another one. Repeat ad infinitum until he found civilization - he had after all heard tales of folks who ventured out on the waves to the islands off the mainland where he was - or any other survivors of the pirateer crew he had been a member of before the catastrophe, if indeed there were any. HEAVE, HEAVE, HEAVE! Wilson pushed and pulled until the makeshift raft was precariously half between the grasp of the shore and the waves, then he leapt on and pushed off with his (also makeshift) oar. Here goes nothing, Wilson thought, marking his first notch in the oar. 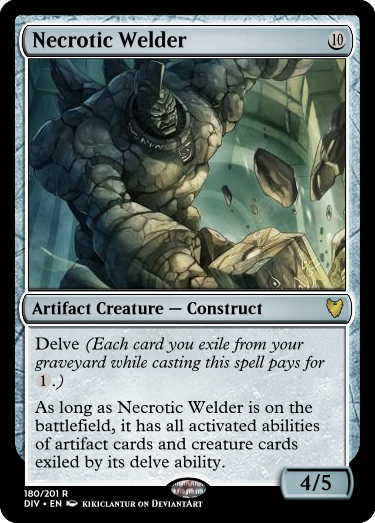 That's right folks, delve is coming back! Here's an album of new delve cards for your browsing leisure. I can't do a more detailed review right now, but let me say: Alchemy Engine is really sweet, good job! Seventeen notches later, Wilson woke to a CRASH! He jerked his head up, the rest of his body following almost in slow motion until he was upright in a crouched position, tense. He glanced from side to side, then looked out of the cave entrance only to find that he couldn't see anything at all due to a sheet of torrential rain. Thunder, Wilson realized, and slumped into a resting position again. This is what I get when I decided to spend the night outside of my main camp... I just hope everything there stays where it's supposed to until I get back. He had been sailing from island to island in what seemed like an archipelago off of the mainland he had originally landed on with the crew of pirateers he had arrived with. After seventeen days and five islands, he had gone far enough to realize he would not get back to his main camp before nightfall and had decided to spend the night in a cave he had found lest he lose his way in the dark. Unfortunately, it seemed as though the rainy season had chosen that exact night to begin. Seventeen days and still no sign of civilization, Wilson sighed. I wonder how far indeed I am away from the mainland. Anyway, with the weather as it is right now, I've got not chance of leaving this cave safely. May as well settle down and try to ignore the thunder. Wilson lay his head on the pile of leaves and dirt he had fashioned into a pillow and closed his eyes again. However, as soon as he did, Wilson heard another sound over the downpour. "Sheila!" And again, his eyes flew open. That wasn't thunder. "I can barely see you! Where are you going!?" To which there was a reply, "There's a cave up ahead! I can see it, just follow my voice!" Voices. Both female, it seemed, but one couls never be sure. Wilson climbed to his feet, wary. These could be survivors of his shipwreck, or the could be hostile natives who also were unfortunate enough to get caught in the storm. He took up a fishing net he had foraged in case it was the latter. It wasn't the best weapon, but he didn't have a lot of options here. 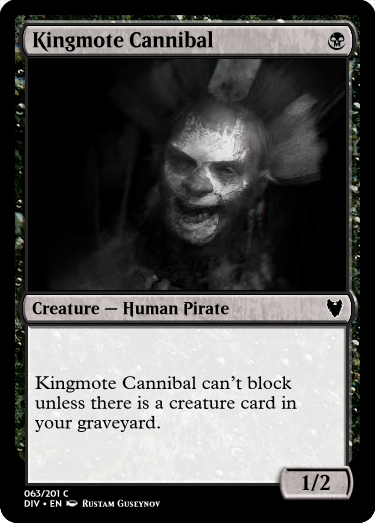 He'd heard tales of cannibals off the coast of the mainland, and this seemed like an event in which they might be hungry. he stepped into the shadows behind an outcropping of stone to have the upper hand if this was the case. It wasn't long before a shadow passed into the front of the cave entrance, blocking out a human-figure shape of the rain. It shook a large head of hair out of its vision before turning around, shouting "Faine! Up here!" The figure - Sheila, Wilson presumed - reached an arm out into the deluge. Another arm - Faine's - reached out and was dragged into the foreground by Sheila, revealing another human figure, also feminine. Both sat down, panting, within the mouth of the cave, outside of reach of the rain. "Dear Storm," panted Faine. "I'm soaked." Then both started chuckling, relieved to be out of the tempest. Wilson had managed to stay invisible to them up until this point, and had begun to consider approaches to either staying that way until the storm left or revealing himself in a diplomatic fashion. However, as it turned out, he didn't need to consider this for long. Sheila turned her head in an exploratory gaze toward the back of the cave wall, setting sight on Wilson's leftover ashes from his fire the previous night. She gasped and leapt up, tapping Faine on her shoulder. "There's someone else here." Faine gasped, leaping to her feet as well. Well, they don't look armed, Wilson deliberated. And indeed, all they had between them was a sack soaked with rainwater containing, presumably, food, clothes, and survivability tools. Coming to a decision, Wilson stepped out from the shadows, brandishing his net. "I'm not looking to hurt anyone if you're not going to hurt me." His voice felt raspy. He hadn't used it in about a month. Sheila and Faine tensed up, looking nervously at his provisional "weapons". Faine took the opportunity to speak, apprehensively. "We're just looking for shelter from the storm. We mean you no harm." Wilson lowered the net slowly. "Very well. But make no mistake, I'm keeping this by my side if things get hairy." "We're just survivors, trying to get back to the mainland." Sheila shot a silencing glare at Faine, indicating let me do the talking. "We'd appreciate any help, even if it's just a place to stay until the storm lets out." Wilson relaxed visibly. "Survivors...? From..." he stopped. If they were natives, they couldn't possibly know about the catastrophe that had happened to Aelna's crew. He wouldn't readily mention her name lest they take advantage of it and pretend to know what he was talking about. "Well, if you are telling the truth, we can agree on one thing. We're both trying to get to the mainland." It was Sheila's turn to relax, and Faine followed her lead. "I hope you don't mind, in that case, if we start up your fire once more? This rainwater is awfully cold." Sheila took a few steps forward tentatively. Wilson tightened his grip on his net. "Wait a minute. Tell me where you came from. I have to make sure we're on the same side here." Sheila opened her mouth to respond, but before she could, Faine whispered, "Aelna." Sheila whipped her head back in another silencing glare, but Faine continued, her voice growing louder as she gained confidence. "We're part of Aelna's crew. Well, part of her former crew. And we're looking for her." Wilson eased his tense body, releasing his grasp on his weapon. "I think we're going to get along just fine." Today we have a mechanic spotlight. 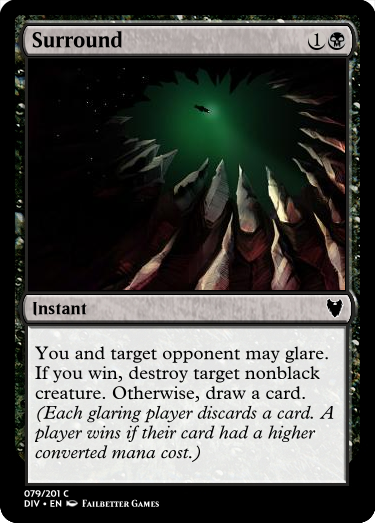 Glare is similar to Clash in that players compete and there is a winner. The determination of that winner, however, is less random than Clash, involving some player choice in the matter. 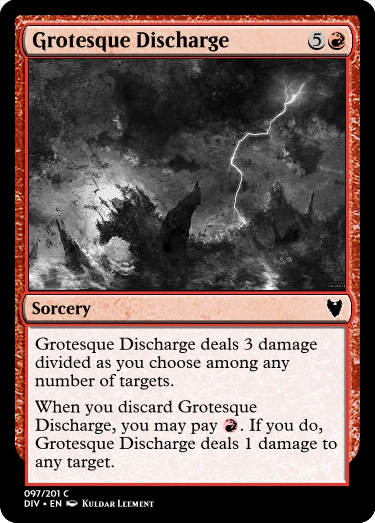 Glare is a perfect mechanic for this set because 1) it adds fuel for Delve, 2) because of the hand size reduction of Horror Counters, there are times in which discarding will be beneficial in more ways than one, and 3) it's flavorful of the hostilities among the various groups of people on Anorost. Wilson awoke groggily as a wisp of fog crept into the cave and stroked him. Fog... That was a different sensation than the rainywetness he had been feeling for the past three days and what he had come to expect in the morning. As he opened his eyes further and turned over toward the mouth of the cave, his hopes soared. A ray of sunlight, albeit flimsy, had cut through the wisps of fog at the cave entrance, revealing a lack of rain. The fog hadn't reach Faine and Sheila, asleep near the back of the cave, yet. Wilson let them be, crawling up to the cave's entrance and basking in the faint sunlight he had come to long for during the battering tempest that had raged for three days straight. He climbed out and sat on an overhang, watching the sun come up and banish the last vestiges of fog. We were lucky to have enough rations to go around for that long, he considered. But then again, if we hadn't stayed cooped up for that long together, we might not have come to terms with each other's identities and plan. Faine and Sheila had been common deckhands like Wilson on Aelna's crew. They and Wilson hadn't shared any common shifts on deck, but may have caught glimpses of each other in the mess hall. Not uncommon in a crew as large as Aelna's. In any case, any of them hadn't been memorable enough to have stuck in each other's minds. After sharing stories and reminiscing about good times on the sea, they had begun to come up with a plan to start heading toward their common goal: the mainland. Wilson had mentioned his makeshift raft and asked if they knew, at least, what direction to go in. Faine and Sheila had shaken their heads, but shared their knowledge of a camp of natives about a day's walk in the direction they had come from. "It was a miracle we weren't noticed." Sheila had said, relieved. They had all heard the tales of cannibals, it seemed. "However..." Sheila had realized, "Those natives do have some things we can use, if we can get our hands on them." Two and a half days of rain later, the three had had enough time to come up with a fairly decent plan, and were hopeful for the future and to get their feet on the mainland once more. Sheila roused herself from her sleep, opening her eyes slowly as she felt a feeling she hadn't felt in days. Warmth. She quickly turned her head toward the cave entrance, revealing Wilson looking into the forest outside, framed in sunlight. She jumped up, shouting "Wilson!" Wilson started, turned his head, smiled. "Why didn't you wake us up? Today's the day!" "Exactly. You all need all the rest you can get if we're going to pull this off." Faine awoke groggily from the commotion. "...Sunlight," she whispered. "Thank Salt." After a quick breakfast, throughout which Sheila kept telling Wilson they "should have woken up earlier, we're going to need all the time possible to pull this off" and Wilson kept responding calmly with "would you rather we try this with sleep-deprived brains? ", the three of them got their feet out of the cave and walking toward the camp of the natives. The forest they walked through, after the three-day storm, was quiet. The only sounds were their sploshy footsteps and the dripping of caught rainwater through the branches. Its large swathes of uncut undergrowth and vines led Wilson to classify it as more of a jungle than a forest. Sheila and Faine did their best to lead them back the same exact route they had come from, but the storm had uprooted trees and broken branches, so they had to take more than a few roundabout routes. True to Sheila's word, by twilight they found themselves entering a more tame version of the wild jungle they had been traversing. A sign of civilization to be sure. If that civilization was to be trusted? Not as sure. They continued, more careful now to stay behind trees and in the twilight's shadow as to keep out of view of pervasive natives. Eventually they came to the edge of a clearing, in the middle of which a fortified wall of tree trunks lined with illuminated torches stood. Native soldiers, barely clothed, with stick-and-stone spears or bows, stood on patrol. Wilson, Sheila, and Faine circled around, taking stock of the area. Sheila cocked her head, whispering "That's our target." Outside of the walls, a hole in the ground, surrounded by a circle of stones, with a wooden bucket and rope next to it. A well. Unguarded. Wilson and Faine nodded and moved into the shadows behind trees. They didn't have to wait long. A young man soon approached, holding a large bucket on top of his head. When he arrived next to the well, he set it down and lowered the smaller bucket into the ground. As he was doing so, Sheila was moving through the forest's cover to be behind him. He finished lowering the bucket and had begun pulling it up, looking into the well as he did so. Sheila took this chance to sneak up behind him and get him into a quick chokehold, muffling any possible noises he could make. The man took his hands off the rope in favor of Sheila's arms, and the bucket fell into the water, making a splash. "Shhhhh... listen to me. No one can hear you." The young man, shouting with voice muffled, became silent. "Good." Sheila pushed the man so that his knees were on the rocks of the well, and so that his body was teetering over the hole. "Try anything, and... you catch my drift?" The man vigorously nodded. "Also good. Now. I'm looking for a ship. Got any leads?" The man tried to speak, but nothing came out but muffles. Sheila shook her head. "Nuh uh. I'm looking for a yes or no." The man hesitated, then nodded. "Is that a yes to 'yes or no', or yes to 'I can get you a ship?'" The man looked confused. Sheila pushed him farther so his knees began to slip on the rocks. He then began nodded vigorously and fighting in Sheila's grip to stay out of the hole. "Alrighty then. Looks like we've got ourselves a ship." She pulled the unfortunate man back from the edge and motioned for Wilson and Sheila to come out. They did so, brandishing their makeshift sticks and stones. 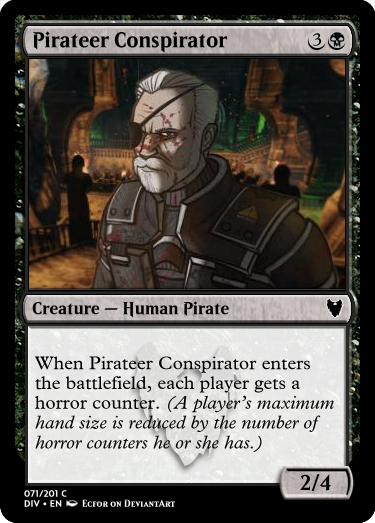 "If you so much as speak a word while you bring us to your ship... we'll make sure you can't speak words ever." The man nodded vigorously again. Sheila unfastened her chokehold and the man jumped away, crawling from the hole of the well. Wilson and Faine ran to surround him on either side so that his escape options would be limited. "I... know a..." the man gasped for breath. "I know a back way into... the harbor." Sheila grinned. "Looks like we caught ourselves a good one, folks!" I am at work and only had time to see the scout land but that intrigued me! "Why are we waiting?" Sheila leaned her head over the edge of their new stolen ship. The theft had gone as smoothly as it could have possibly gone. In the cover of night, the four of them had snuck through a hole dug underneath a part of the wooden tree trunk wall. Everyone in the village was either asleep or, by some lucky chance, looking the other way. "He wants to come with us." Wilson told her from the dock. "What? Just because he helped us escape doesn't mean we're friends!" "Show some thanks! He probably wouldn't have helped us in the first place if he wasn't considering leaving in the first place!" "Whatever. I'll be getting the rigging and sails ready." Sheila turned and strode off. "Is she not the one who strangled me? I am not sure she'll come around..." The man's voice was heavily accented. Wilson was surprised he knew their language, and chuckled. "What's your name anyway?" He asked. "Wilson. She's Sheila, and she," gesturing at Faine, who was climbing the rope ladder onto the boat, "is Faine." Ghak nodded in Faine's direction, who returned the gesture. Wilson pointed for him to follow her, saying "Welcome to the crew." Ghak bowed, responding "Thank you. It has been a... thought... of mine, to leave this place and see what lives beyond the water. It seems... I needed only the... courage?" Ghak clambered up the rope, then called to Sheila. "Let me help. I know these ships better than you do." Sheila laughed. "Really? 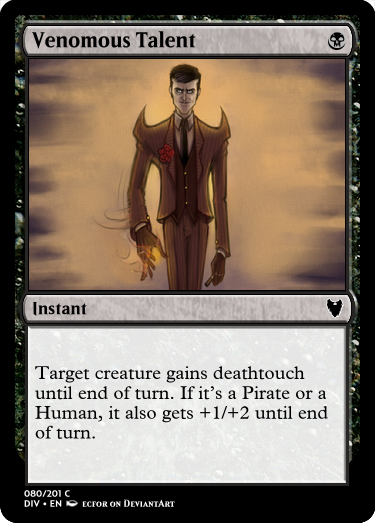 'Cause I've been a pirateer for seven years. You get to know the sea more than you know the land." Wilson followed them up, checking the deck for any activities he could enact to make their journey any quicker. It took a few hours for the four-person crew to get everything shipshape. They managed to raise the anchor just as the sun was peeking its eyes above the distant horizon. They all felt the sea breeze in their face and hair; a long-awaited sensation. "What are you going to do once we get there?" Ghak spoke to Wilson as they faced the rising sun. "Let's just say... destiny has its eyes on me." 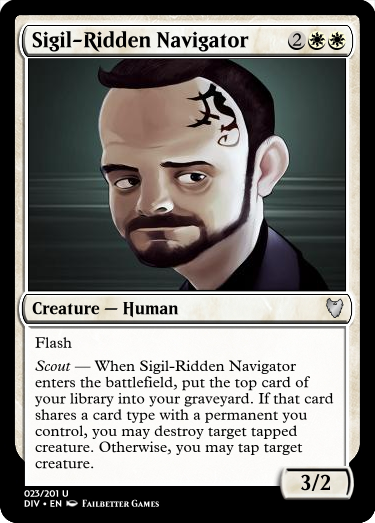 Since that previous story blurb had no spoilers in it, let's do another mechanic spotlight. This time on Scout. Scout appeared in the last set of the block, Anorost. 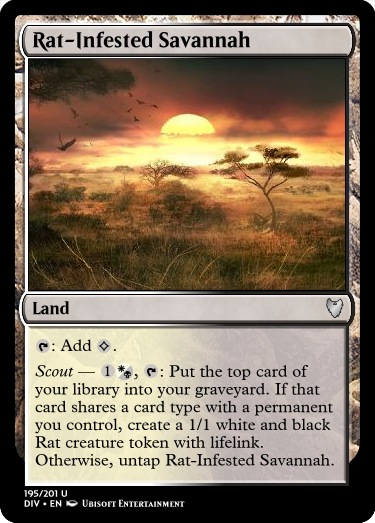 It is representative of people exploring surrounding lands in a similar fashion to Ixalan's Explore (but in a less similar mechanical vein) and mostly appears on lands. Without further ado, here's an album of Scout cards. “Have you ever seen one so big?” The crew shook their heads as Sheila gazed in awe at the colossal leviathan that floated peacefully in front of them beneath the waves. 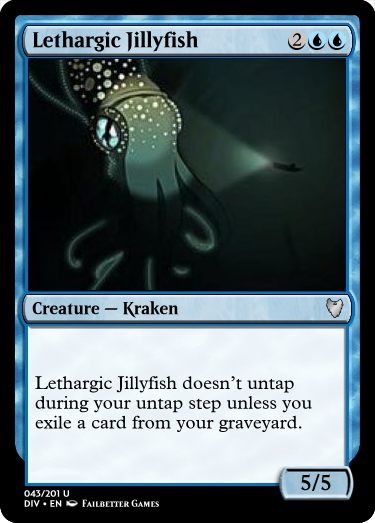 “Seven years out at sea, and this is the largest jillyfish I’ve laid eyes on.” The crew stood for a minute, marveling at the thing’s beauteous grotequeness. He was interrupted by a gurgle as the wave’s strength hit him. He didn’t have time to check if anyone had heard or heeded his call, much less take a breath, before he was surrounded by salty water. Where had that come from? Not two minutes earlier they were cruising along with the wind at their back. The water subsided, and Wilson gasped for air.He shook the water out of his hair and eyes, searching with blurry vision for his crewmates. “Is everyone alright?” He heard coughing. Ghak, he recognized. And Faine. As his vision cleared, he shouted “Sheila! ?” Faine responded, “She’s… over here.” Wilson followed her voice to find Sheila unconscious. Her head had hit the mast when the wave struck, but she somehow hadn’t been dragged off. As soon as Wilson eased back, relieved that everyone was still with them, another shadow crossed his vision. This time accompanied by an inhuman screeching. Wilson whipped his head around to the rear of the ship, where an astounding sight awaited. 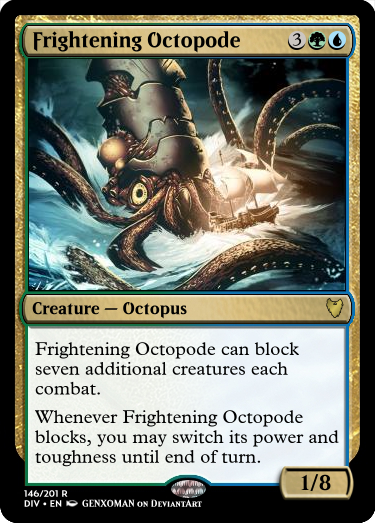 A hulking octopus reared its ugly maw in front of them, screeching death and destruction. Wisps of purple fog wrapped around its head, and as it brandished its tentacles, Wilson could see that the fog extended all alongside its body. Wilson had only seen that fog in one other place, and that was when they had faced Maxwell’s army. Wilson blinked. “This thing has a cannon?” Ghak was belowdeck before he could get a response. Faine whimpered in fear beside the unconscious Sheila. “Sheila, wake up! We need you with us!” Faine shook her with no luck. It was all Wilson could do to stop himself from freezing in fear, but he knew that in order to get out of this pickle alive, they had to get the sails up and running. Wilson heard a BANG! followed by another round of animalistic screeching. Ghak had blown a cannonball into the great octopus’s head. The tentacles, which were nearing the powerless Sheila, retracted somewhat. “Yes! You’re doing great, Ghak!” Wilson shouted in encouragement. Wilson and Faine tightened the ropes and felt some pressure as the wind began to catch the sails once more. BANG! Sccrreeeeeaaacccchhhh!! The tentacles uncurled themselves from the ship’s rails, and the crew fell backward as a gust of wind threw the craft away from the monster. As soon as the crew had docked and disembarked on the dry land of the mainland once more, Sheila was rearing her head to go out to sea once more. "This gal wasn't meant to be on land for more than a minute at a time. I was born at sea and I'll die there too. Faine, come on!" She strode over to a burly man who was looking for recruits for his crew. "You look... familiar. Have I seen you before? My previous crew was with Aelna. Does that name ring a bell?" The man chuckled. "You made it! Another survivor of catastrophe. You'll fit in just fine on my crew then. I'm Zu, the new captain of Aelna's old crew. I was the first of her crew who made my way back here. After learning that she was nowhere to be found, I decided to step up as captain, as her first mate was also lost or drowned." Sheila bowed her head in recognition of the man's title as well as in mourning for her old captain and first mate. She turned to Faine and said, "What do you say, old matey? Faine grinned and stepped forward, introducing herself to the new captain. Both then turned to Ghak and Wilson. Ghak put on a thinking face, and as he was making up his mind Wilson spoke up. "This is your path to follow. I've got my own. If Serene smiles upon us we may meet again, but I've got to go inland and up." Sheila and Faine nodded, saying goodbye. "It's been a life-changing voyage." Sheila said. "I'm glad we met," piped up Faine. Ghak raised his head, resolute. "I cannot go with you either. The goal of my journey is to explore inland as well, even if it means splitting up from you and from Wilson." They said their goodbyes and thanks and each went their separate ways, Sheila and Faine to board Zu's ship, Ghak down a lamplit side street, and Wilson down the main road he had entered the city from all those months back. As he was walking off of the docks and onto the cobbled roads, he heard a muffled BARK! He stiffened. Could it be...? 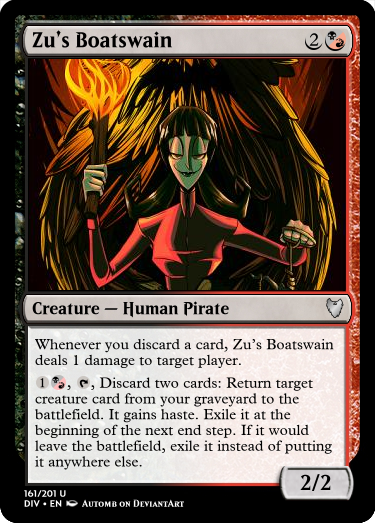 He turned around, and off of Zu's ship bounded a familiar face. "CHESTER!" Wilson shouted with glee. He ran towards him, letting him jump into his arms. "I thought I'd seen the last of you!" Wilson breathed, relieved, as Chester licked his face all over and settled into his warm embrace. Wilson followed the sound of Chester's exploratory sniffling through the dark caverns. They had spent the last two days venturing into the caves from which they had come in the first place, and at the other side of which was his homeland of Wildbore. His makeshift torch had run out after a mere day's worth of travel, but he had been too far in to decide that going back to get a new one was the right choice. He and Chester had weathered on, using Chester's great sense of smell and occasional clumps of bioluminesent lichen to lead their way. Their journey had thus far been uneventful, albeit slow. Wilson felt along the cave wall. There! A crevice. He wiggled his way in, feeling farther in more and more until the space was too thin to go any farther. Chester squeezed in along with him, rubbbing against his legs. They both held their breath, hoping against hope that whatever this creature was would deem their location to difficult to reach. A faint wind reached them as the thing passed by their hiding place, then stilled. And again. And then a scraping. Claws against stone. A whiff of an unholy stench as the being reached a claw-headed limb into their crevice, growling as it did so. Then... it retracted. Another breath of wind as the thing moved away, looking for easier prey. Wilson and Chester exhaled, then waited another few minutes to make sure it had really gone before sliding out of the crevice and continuing upward. Not long after, Wilson pulled himself and Chester up onto another crag of cold stone, then raised his head to feel a welcome sensation - that of fresh air. He gasped. Forty feet or so above them they glimpsed a ray of sunlight. They had made it. Then Wilson felt a great pain in his head and collapsed unconscious. 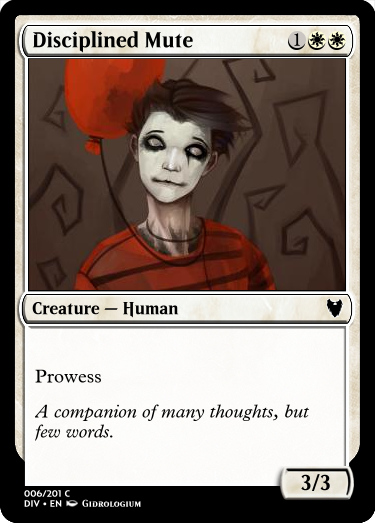 In the darkness of his sleep Wilson heard a deep chuckling. He looked around, searching for its source, but this nightmare was darker than the caves had been. The chuckling rumbled all around him, deepening and becoming more robust. It wasn't coming from a specific place- more from all around him. His surroundings were slowly illuminated by a soft purple glow, and as his eyes adjusted to the low light level he realized that he was in a world of fog. Purple fog. The chuckling by this point had evolved into a sinister laughter, one that was accompanied by a great wind. The fog blinded him as it rushed toward his vision just as the laughter deafened his hearing. GASP! Wilson awoke to Chester's whimpering and soft tongue on his face. After realizing that Wilson was awake, Chester yipped in relief and barked upwards, indicating his desire to reach the surface. How long have I been out? Wilson wondered. He stood warily, then stumbled as dizziness got the better of him. That nightmare was the most real one I've had since... since I was on Aelna's ship. Maxwell's influence is growing stronger the more I continue on this journey. He considered heading back, laying low in the harbor town, maybe joining Zu's new crew. He stopped himself. Am I crazy? He reasoned. I know from Aelna's experiences that these nightmares will only get worse, no matter where I go. The only thing I can do is confront them. He steeled his resolve and began climbing, Chester at his side. As he dragged himself up the final crags to reach the end of the cave system, he noted, "Looks like we're back where we started, Chester..."
Something terrible has happened here. It was easy to see. The purple-tinted earth looked parched, and what little vegetation Wilson could make out here and there was dead or dying. "Maxwell and his army really did a number on this place, huh Chester." Chester whimpered in agreement. What's his goal, anyway? What does he hope to achieve by marring the beautiful landscape like this? What little sunlight seeped from the sky also had a purplish hue, and as the two of them began walking, clouds covered the light. Wind began tugging at Wilson's clothes, pushing him in a direction he did not recognize. He felt a powerful presence from that direction, and one look at Chester confirmed his sensation was a shared one. Purple strings of fog appeared, being tugged by the same winds. Remember, thought Wilson. The only way to get rid of these nightmares is to confont them. Wilson and Chester pushed onwards. A small shadow appeared close to the ground in front of them. Chester barked at it, and Wilson started. He looked up, thinking its source might be a bird up above them. But no, the skies were empty save for the clouds. If there's no sun, why would there be a shadow? Wilson thought. Then the shadow hopped toward them. Chester growled menacingly, and the shadow bounded away. "Chester... that looked like a... rabbit?" If the land has been marred like this... Is this the effect it's having on the local wildlife? After a few hours of walking, Wilson spotted a large building in the distance. Above it was a circle of clouds. It seemed like all of the clouds that had been hanging above them this whole time had converged on this one location. The wisps of fog that the wind had been tugging on ended by the gates to this building as well. "Looks like we found our eveil hideout." whispered Wilson. Chester just whimpered louder than before, but steeled himself to his task of protecting his friend. Wilson suddenly felt a great pain in his temples. He fell to his knees, trembling. Chester licked him in concern. Then he heard a voice. A comforting one, femenine, motherlike. And yet commanding. Serene. Be careful, my child, it boomed in his mind. Maxwell is powerful. There is a strong chance that he will overcome you and all you hold dear. Wilson shuddered. "How... how do I stop him?" He sensed a sad smile from beyond, whereever Serene was. He will try to kill you. Wilson shouted, frustrated with Serene. "You're not answering my question! How do I ensure my survival, and of those I hold dear!?" Serene whispered, fading from his mind already. Hush. How to prevent your death? Have a strong will. His pain, and Serene, vanished from his mind. Wilson stayed kneeling, trembling, as Chester licked him concernedly. "That wasn't very helpful..." And yet, I must continue. To free myself and all others who suffer my pain. Time for our third and final mechanic spotlight. 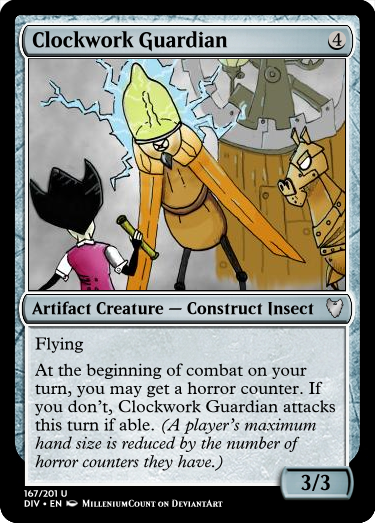 This time it'll be a mechanic whose first appearance was in Anorost, the set preceding this one. 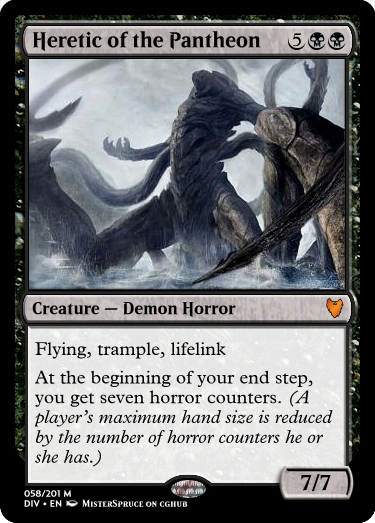 Horror counters. 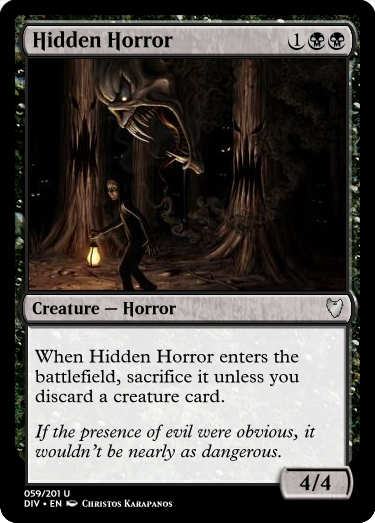 Without further ado, an album of cards that utilize this mechanic in some way or another. Wilson knelt in the shadow of a shadow. That is to say, the shadow of a tree, but this tree was only a shadow of its former self. He leaned out from behind it so that he could see the castle walls and sighed. "It's impenetrable." He frowned. "But that won't stop us from trying, now will it, Chester?" Chester growled determinedly in response. They had waited until dark, inspired by their previous stealthy mission with Sheila and Faine at the native village. Only this time, the walls they were trying to break into were made of stone, and there was no external well for them to attack. There were potential hostages - guards lined the parapets of the walls. But there was no way to get to them, much less hold them hostage against all of the other henchpeople with weapons. The more I think about this, the less it seems like the previous infiltration, Wilson thought worriedly. But he began sneaking toward the castle walls despite his best interests. Through a mixture of the cover of dark, purple wisps of fog, and clouds, he and Chester managed to find the firm stone walls of the building without being seen. Now, toward the back of the castle. There's gotta be a back entrance, or sewer... Wilson didn't want to think about that last part, but he would do anything necessary to face Maxwell at this point. They pushed onward, keeping close to the walls. As he turned the corner, reaching the back side of the castle, Wilson felt a texture that wasn't stone. Wood, he thought. A door. He turned to face it, feeling its rough surface, then pushed. Nothing. This door was designed to only open one way. Out. nevertheless, he pushed harder, Chester lending him his aid. The door didn't budge. The door suddenly flew outward, sending Wilson and Chester flying backward. Wilson heard voices - "Get him!" "Who is that?" "A sneak! 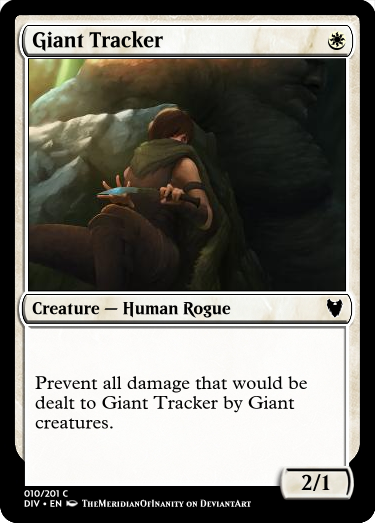 A thief, maybe?" but in his dizzy state could not get his vision to focus on who was speaking. Over Chester's barking and growling he heard "Get him to Maxwell, see what he says. And someone please muzzle that mutt!" Rough hands grabbed Wilson as he heard Chester's barking cut off abruptly. His hands were tied and he was shepherded fiercely into the castle. Wilson was brought through countless musty stone corridors until he was finally led into a great hall, carpeted and glimmering with candlelight. In the center of it stood a massive glass tank, almost reaching the ceiling of the room, about three-quarters full of a oily purple liquid. On each side of the tank were two metal cyclinders, about average human height. Between them stood an unfriendly looking metal chair with straps and syringes attached to it. On each wall, tables held books and papers as well as vials of purple liquid. Maxwell stood at one of them, hands splayed on its surface, reading a text intently. "Sir?" One of Wilson's captors spoke. "We caught a potential thief trying to sneak into the castle. Should we put him with the others?" Maxwell turned. His figure was tall, lanky. His dark hair lay on his head like a rug. Wilson knew it was him, the same presence from his nightmares. He smiled, and Wilson shuddered in remembrance of the spooky chuckling and sinister laughter from his dreams. No, Wilson thought. Fight the fear. To survive, I must have a strong will. He resolved to keep a stone face as Maxwell strolled up to reach him. "No, no. Keep him here for a while." That voice. That voice that had been torturing his nightmares for months somehow seemed even more evil in the flesh. "You have... remarkable conviction. I'll give you that. It's not often we catch someone near our castle grounds, much less someone trying to sneak in. What is your purpose, I wonder." Wilson opened his mouth to reply, but Maxwell quickly put a finger to his lips. "Was it perhaps to get a sip of my famous elixir, guaranteed to awake powers you didn't even know you had?" As Maxwell said this, some of his henchmen glanced at him in lust, then at the colossal tank of purple. Maxwell chuckled. "You might have to wait, it's still in beta. And there's a long waitlist." "Or... don't tell me... you have friends here? It wasn't that long ago we received a shipment of willing test subjects for the advancement of the research for said elixir. They were..." He turned to one of his guards. 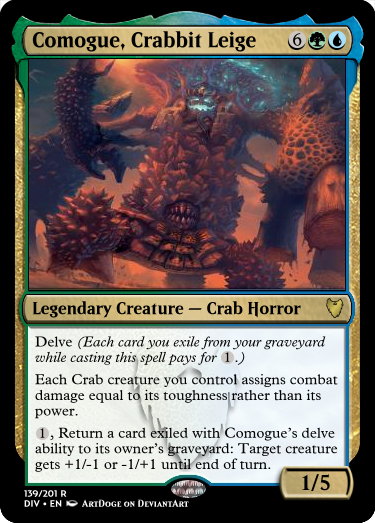 "From the sea, no? They had a ship... what did they call themselves? Pirateers?" Wilsons breath caught in his throat, and he whispered with some effort, "Let me see them." Maxwell's smile broadened. "A ha! Not so fast." He turned to Wilson once more. "As I was saying, you have remarkable conviction. You could have abandoned your people and gone on with your life, but no. You had the courage, and the gall, to follow them, all the way straight to me. And I admire that." He paused. "That's why I'd like to offer you a choice." Maxwell leaned in and down so they were face to face, eye level. "Join me. This elixir will awaken new powers within you. And once I perfect it, that power will belong to everyone!" He lowered his voice. "But you and me first." He leaned back, standing up straight again. "You'll help me one way or another - either as an equal, or as a test subject." Wilson strained against his bonds. "Never!" he shouted. jumping towards Maxwell in fury. He crashed straight into him, bringing them both to the floor. Without his hands, his open mouth was the only weapon Wilson had. He bit Maxwell's shoulder, and Maxwell grunted in pain. But Wilson never stood a chance. He was overwhelmed instantly by Maxwell's grip and the groups of guards surrounding the room. Maxwell growled. "That's enough. Put him with the others. 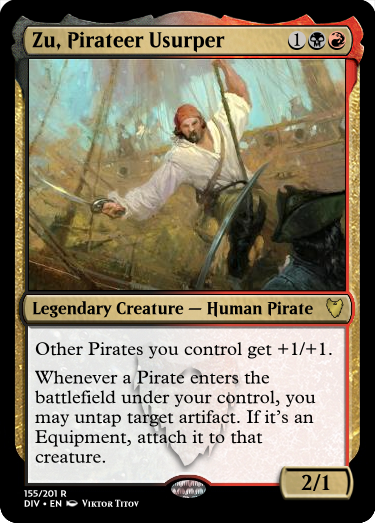 He'll get to see his pirateer friends, at least for the short time they have to live." Wilson and Chester were led down countless flights of stairs, each level down growing darker and more musty than the last. Wilson had begun the journey struggling against his bonds, and Chester had supported his rebellion by barking muffedly through his muzzle, but had since quieted, resigned to their capture. Finally, they reached a level of the stairwell in which they stepped out of the stairwell and into a room with iron bars separating one half from the other. A group of prisoners sat dejectedly on the side away from the stairs, and Wilson and Chester were brought to the door and shoved in with them. As the door began to close, however, one of the prisoners, who had apparently broken free of his bonds, shouted and ran straight for the open door, pointy metal spike in hand. Wilson gave a start and jumped quickly to the side just as the prisoner dove weapon-first at their captors. Wilson could spot a few others straining against their shackles who would do anything to help out their friend escape. The prisoner managed to get the upper hand on the closest of the guards, stabbing his spike into her shoulder. She yelped in pain, falling to the floor, as three other guards surrounded the assailant. The man growled at them, realizing the odds were against him. It was a growl signifying "I'm not going down without a fight." Wilson thought quickly. If this man gets free, he can free us all. But how could Wilson help him? His hands were, quite literally, tied. It proved to be too late, anyway. The man's spike had lodged itself in his previous victim's shoulder, and without a weapon, the guards had subdued the man quicker than Wilson had been able to begin formulating a plan. They had him in ropes and up the stairs before any other prisoner could make a move. The injured guard had left as well, leaving two guards to lock up Wilson and Chester. As he felt his shackles tighten, he looked around at his new acquaintances. He nodded and smiled halfheartedly as he recognized his roommate from Aelna's ship bunkers. It was a reunion, but not the same kind they'd hoped for. As he glanced around the room, his eyes fell on a woman whose dirty red hair covered her face. She had been apparently oblivious to the attempted escape and fighting that had just occurred, according to the glassy look her barely visible eyes had. Her body was covered in scratches and her leg was set in a cast. Aelna. How she had survived the catastrophe, much less the trip here and the torturous nightmares, Wilson couldn't imagine. He crawled over to her and tapped her shoulder. No response. "Aelna. It's me. Wilson." Her eyes glanced in his direction, then went back to looking forward. Wilson grabbed her shoulder and turned her face to look at his. "Aelna, can you hear me?" Her eyes slowly focused and she gasped. "Wilson..." she croaked. And then smiled, eyes gleaming. "What a reunion, huh." There was still a bit of her old self in that broken husk of a person. They didn't have much time to share stories, however, because another group of soldiers barged into the room. They opened the cell gates and began unlocking everyone's shackles, replacing them with the rope bonds Wilson had just gotten out of. As they dragged Aelna up on her feet, she cringed in pain. She was in no position to walk with her leg in a cast. Wilson stepped over next to her, saying "Lean on me." She did so, moaning in gratitude. The guards led the group of prisoners up the stairs until they reached the top. Aelna and Wilson lagged behind due to her injury, but every time they stopped to catch their breath, guards poked them in the back with spears. They eventually got to the top, where they were herded into the great carpeted hall, where Maxwell waited. The prisoner who had attempted to escape sat in the metal chair in front of the great tank of purple liquid, bound and gagged. His eyes wide in terror. "I heard," Maxwell drawled. "That there was some commotion in the cells a few minutes ago." He paused, looking at each one of them individually. "Why would anyone want to assault any one of my helpful staff here who keep you so well nourished? And why would anyone want to escape my castle? Escape this great experiment you all have the honor of being a part of?" He waved his hand as if batting off a fly. "But no matter. One of you did, despite my best intentions to keep you all here safe. Whatever his reasons, I care not. All I care about is empowering you all with my great serum, my great life's work to make powerful beings out of every one of you. That's why I'll be abstaining from any sort of punishment. Rather, I'll be giving this man the absolute honor of testing this miracle elixir. And you all..." he grinned. "Will see its power." "Down to business. You all know the drill. This machine will activate your superhuman powers. As an... uncontrollable side effect," he smirked, "it will bind your mind to me. So..." he set his face in a serious fashion, "that you can work for me at a higher level as my most trusted second-in-command. However," he looked pityingly at the man in the chair, "if you do not have the gumption, the will, to accept this power, it may destroy your mind altogether." The rest of the prisoners looked in fear at the machine. It was obvious they had seen its power before, and heard this speech. Wilson turned to Aelna, who had on an expression of pity. 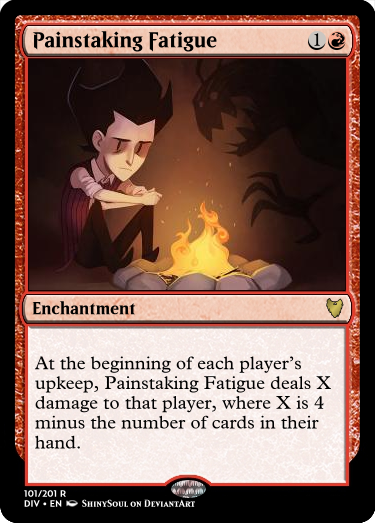 "Why is this... a bad thing? Won't he become more powerful?" Aelna responded, "You ever consider why he doesn't just use it on himself?" and turned away. "Let this be an example of how to serve me to your fullest." Maxwell pulled the lever sitting on the table next to him. The purple liquid in the giant tanke began bubbling. Pipes extruding from the tank began filling with purple while smoke puffed from various holes in the mechanism. The "test subject" began blubbering as two purple rays of light settled on his temples. The light grew brighter and brighter, shattering into multiple rays spread across his whole face. The man's body began seizing, and his arms and legs struggled vehemently against his bonds of iron. Then, suddenly, a huge BANG, a FLASH of light, a puff of smoke, and silence. Maxwell coughed, waving the smoke away from his face. He strode up to the man in the chair, who lay still. After taking the subject's pulse, Maxwell turned solemnly to the crowd. "I'm sad to say he didn't make it." Then after a moment of silence, "There might still be a few kinks in the mechanism." His eyes glimmered. "Or perhaps he was simply not strong enough." Wilson and his fellow inmates were woken by the CRASH of a metal door as a guard entered their prison. "Wakey wakey, folks! The big M says he's fixed the kinks in the mechanism! You all know what that means! Next in line to be a test subject is..." He looked at a piece of paper in his hand then said, "Aelna?" No one spoke. No one wanted any of them to be the next one to leave, so no one gave away Aelna's identity. "C'mon now, don't be shy. Speak up, Aelna. We don't got all day." Aelna raised her head, then struggled to raise her body up to lean on the wall. "Well? I'm ready." Her tired straggly voice echoed dimly through the silence of all of the other inmates. The guard raised an eyebrow. "Ready, are ye? That's the most enthusiasm I've seen in... well, forever." He shrugged, unlatching Aelna's shackles. "Anything for the greater good, am I right?" Wilson jumped in front of them, chains rattling. "No. Take me instead. She's... not strong enough." Aelna growled at him. "This is not your fight, Wilson." Wilson stared her down. "To make it through this, you have to have a strong mind. Look at yourself. If this works... no one else will have to die." He hesitated, then whispered, "And besides... if we do happen to not make it, we can finally be free of terror... forever." "Who says your mind is stronger than mine?" Aelna shouted. But the truth shone in both of their eyes. She looked disheveled. 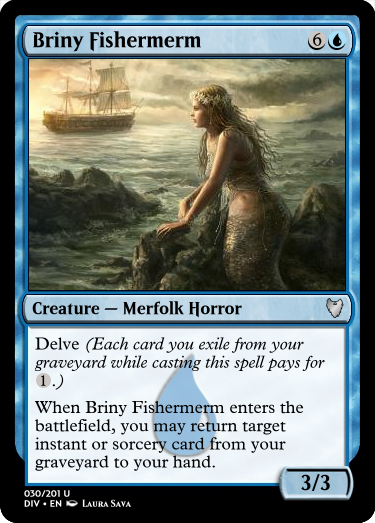 Her nightmares that had plagued her at sea had obviously gotten worse, and they both knew it. The guard looked troubled. "Alright," he said at last. "I'll talk to Maxwell about it. But for now, you're both coming with me." An hour later, Aelna and the rest of the prisoners stood in the great hall, looking up at Wilson, who was tied, gagged, and imprisoned in the sinister metal chair. "As it turns out," Maxwell was saying, "This courageous and honorable young man's sacrifice could make life better for all of us. Our previous test subject," he gestured at Aelna, "is weak and utterly incapable of handling such power as is held in this miracle elixir. Which, by the way, I have perfected even more since yesterday. This strapping young lad could help us all to victory. Either by being strong enough to accept the power I give him, or by giving us a tremendous leap forward in our research as we examine how this treatment affects one with his experiences. Really a win-win, both ways." Aelna knelt, clutching a blubbering Chester in her arms. Wilson averted his thoughts from them concentrating. Strong will. I cannot falter. I must keep a strong will, but furrowed his brow when he heard a worried cry from Aelna. Maxwell glanced at her. 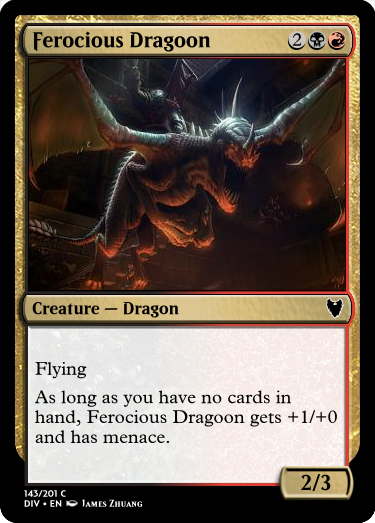 "Out of mercy, I'll spare you all the lecture. You know what happens now." And pulled the lever. FLASH A great purple light. CRACK! A great thunderous noise. A deep torturous burning in every facet of his body, pinpricks of white-hot pain. The sensation of heat and smoke. Nothing in view but darkness. I interrupt the story at this point to showcase the archetypes that can be found in this set plus a small album for each one. When Wilson woke, he was facedown on the floor. His metal bonds had been broken and his gag had been ripped in half. Did I... did I do that? thought Wilson in wonder. He raised his head to the sound of a sinister chuckling. "Looks like today's our lucky day. The day we are all SAVED!" Maxwell shouted in glee as he knelt next to the collapsed Wilson. "He survived. Not only survived, but is imbued with ULTIMATE POWER!" Maxwell's chuckle turned into a gasping guffaw. Wilson pushed humself up to his hands and knees and looked up at the colossal tank of purple liquid. It had been three quarters full when the lever was pulled, and it now stood at the one quarter mark. "Yes," Maxwell stood. "Yes, my child. Stand up. Stand as an equal with me." He held out an arm for Wilson. Wilson, trembling, took it. He stood, then stumbled. "Easy there," whispered Maxwell, taking his hand for steadiness. "Ultimate power doesn't come that easily. Take your time." Wilson finally stood tall, dizziness leaving his mind. He raised his head to find huge explosion marks streaking out from the metal chair he had been tied in, which had been cut in two. His jaw dropped at the idea of the sheer power he must have stored in his body as he looked around the room at the group of awestruck, yet hopeful, prisoners. "Yes," whispered Maxwell. "We are all saved on this blessed day." And then his smile dissapeared. "Too bad there's not enough serum for everyone." Wilson looked at him. No,, he thought. "That wasn't the plan." he said through gritted teeth. Maxwell feigned surprise. "Oh? I wasn't aware you were in the position to bargain." He brought his eyes to Wilson's eye level. "I control you now, buddy." He grinned once more. "And my first order is to execute all of the prisoners." The expressions of the prisoners turned instantly from awe to fear. The stronger of the bunch struggled against their ropes, while the weak knelt in surrender. Wilson turned to face them, eyes wide in apprehension. Purple fog surrounded his vision, covering everything but the ragged group of people in front of him. As he took a step forward, however, he heard a voice. Fight the urge. Where had it come from? He glanced from side to side, noticing a visible change in the opacity of the purple fog at the edges of his vision. No one in the room had spoken. He took another step forward, raising his fists in a destructive manner toward the prisoners. He doesn't own you. There it was again. The voice was coming... from within his own mind. And... it was right. He didn't feel... oppressed. He felt... free. The purple fog dissapated, leaving Wilson standing motionless in front of a group of frightened, innocent, people. "Well?" Maxwell sneered. "What's taking so long?" Wilson lowered his arms, then turned around. "You... Don't.... Own.... Me..." He whispered slowly but clearly. Wilson's grin dropped and he instantly gestured to his bodyguards. "Take him down!" He shouted. But it was already too late. Wilson ran toward him with a newfound speed in his step, jumping in a tackle to take him down. Maxwell never stood a chance against Wilson's newfound, metal-ripping strength. The light left his eyes in an instant as Wilson thrust his body against the cold stone floor. WOOF, WOOF! Chester's exultant bark rang out as the imprisoned pirateer crew cheered, rushing over to Wilson and struggling to catch him as he stumbled. Even though his body was more powerful than it had ever been, Wilson felt dizzy and weak after all of the events he had just experienced. Sunlight streamed in through the high-set windows, clearing the air of the purple smoke. It seemed Maxwell and his machine were the source of the circling clouds, so with his machine defunct, the sun could shine again. The windows even looked clear again, free of their purple tint they had had. 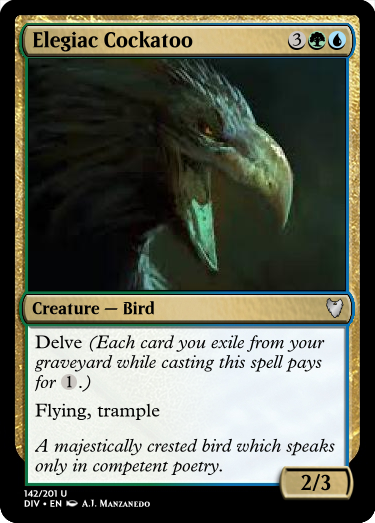 CAW! CAW! The whispering sound of wings fluttered by. A flock of birds winged by the window, finally untethered from the shadow realm Maxwell's machine had bound them to. Since their minds had been bound to Maxwell's, his guards instantaneously were freed of their imprisonment. Each had a different reaction when the purple light left their eyes. Some threw down their weapons in disgust, other fell to their knees blubbering about all of the evil deeds they had commited under Maxwell's reign, while others couldn't help from laughing in relief. Wilson relaxed in the arms of his former crewmates as they praised and thanked him. He heard Aelna's voice saying "I never let my faith in you run out, kiddo..." before it was lost in a fit of coughing. Wilson sat up quickly. "Aelna. What's wrong?" Aelna gave him a weak smile. "You already know what's wrong, kiddo. This place..." Cough, Cough "We've been here too long. His... influence... has been ingrained in us, some more than others... But I'm afraid my weakened body has been pushed to its limit." She sighed, and smiled. "But I sure am glad to have seen you one more time before my passing." She closed her eyes. Wilson shook her eyes back open. "No... you shouldn't. You can't." Aelna managed one last weak smile. 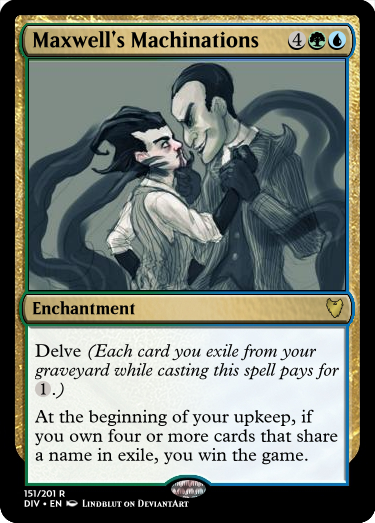 "I already have, kiddo." And her light left her eyes. 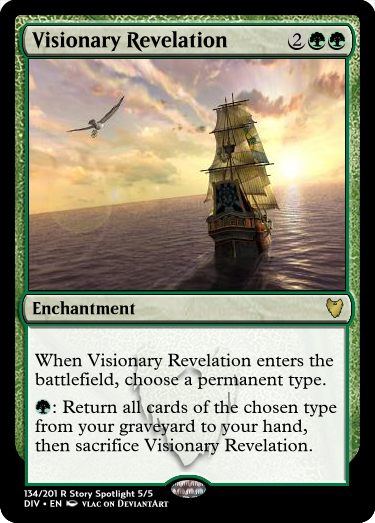 After the threat of Maxwell's great plan had been eliminated, most of the pirateers decided to go back to doing what they loved: sailing. They gave Wilson the option to come back with them. He would have been welcomed with open arms. He chose to stay above and do what he did best; cultivate the earth with crops. He even convinced some of the pirateer group to stay with him and begin their own settlement with many of Maxwell's old troops in and around the old castle. 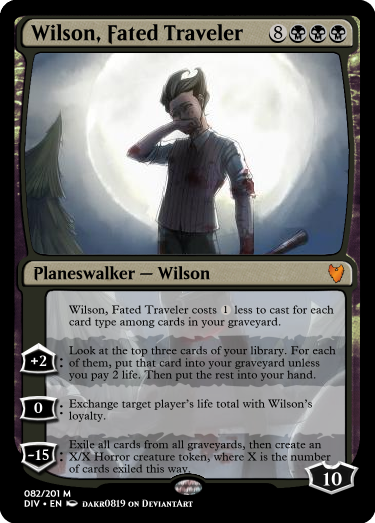 Wilson never really did get the real hang of planeswalking. Since his powers were bestowed upon him by force and not by choice, they never sat well with him and he would always get sick to the stomach when attempting to cross the blind eternities. That isn't to say it wasn't possible for him, though. He got to see his fair share of other planes in the multiverse. But he always preferred Anorost, where his stomach pain was greatly reduced, his crops grew plentifully, and friends and family surrounded him. I haven't had time to read the story but I'm planning on doing it eventually. 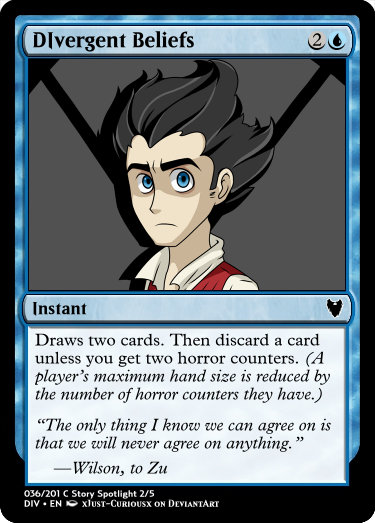 I like most of the cards I've seen although I'm not really a fan of horror counters, but it's nice to see you've planned well around them. 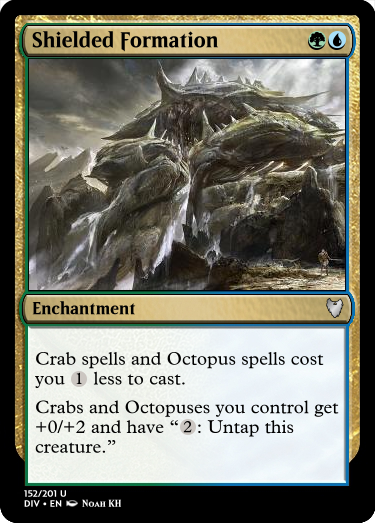 Minor nitpick: I believe chant of gratitude should say "tap any number of untapped creatures". 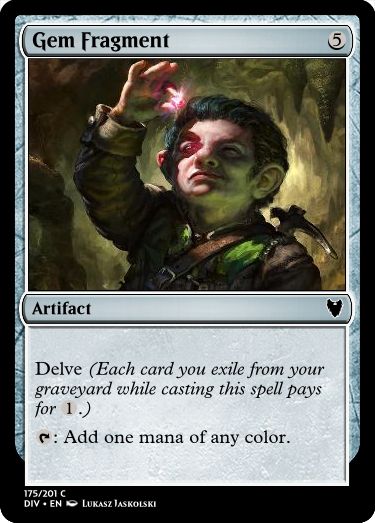 Also I'm not 100% sure, but I believe that without it targetting it would return itself to your hand if you choose enchantments. korakhos thanks for the comments, I will update the cards accordingly. 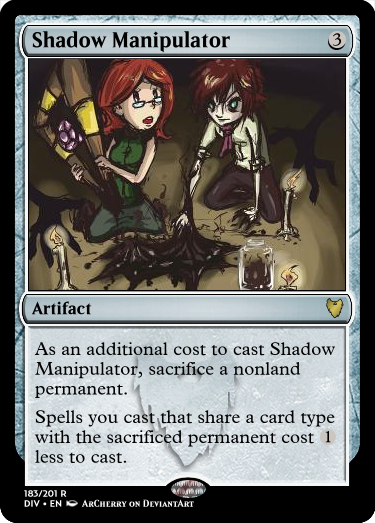 Shadow Manipulator: Memory issues seem possible. 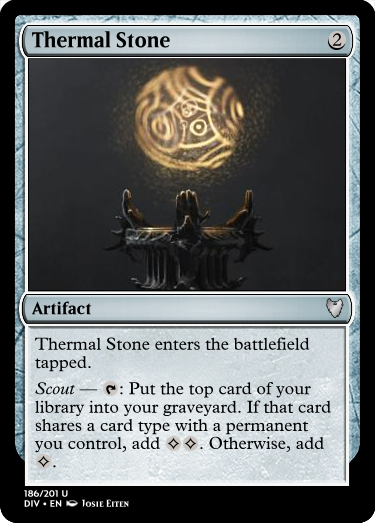 Thermal Stone: Looks a bit bonkers to me. 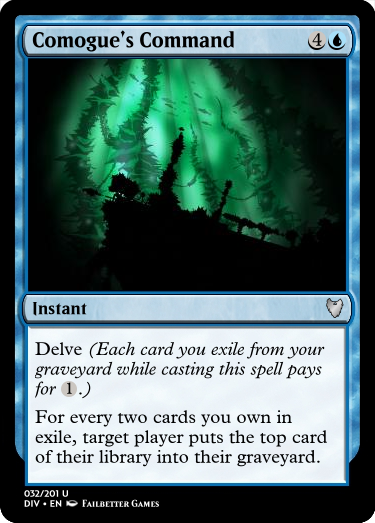 I kinda wish that the delve cards had more flavor justification for having delve. Loyal Parrot: This could easily have just have flying. 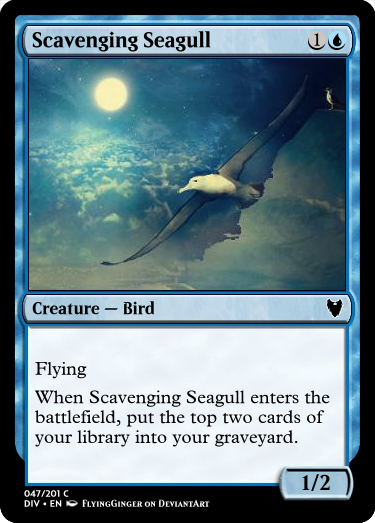 We got 1/2 flying for a single white mana in a core set just recently. 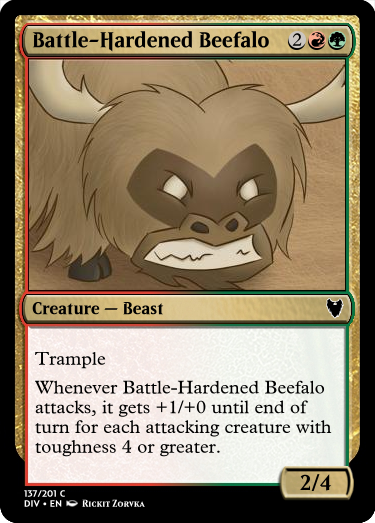 Mysterious Specimen: "Attacks each combat if able" is usually a drawback reserved for red cards. I can't recall seeing it in green. This specifically reminds me of Marauding Maulhorn. Luminescent Dolphin: Dolphins aren't fish, lol. 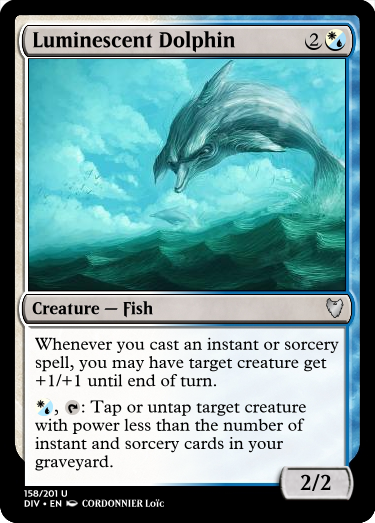 If Whales can have their own creature type, then Dolphins can too. 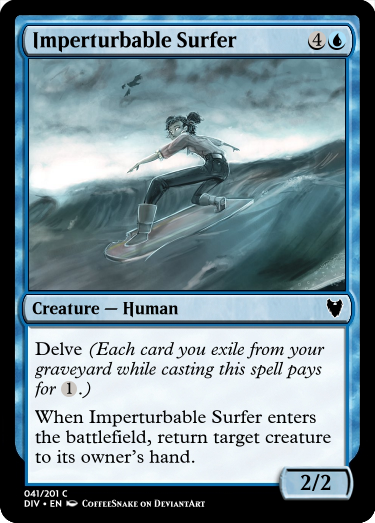 This looks like a monoblue card to me. 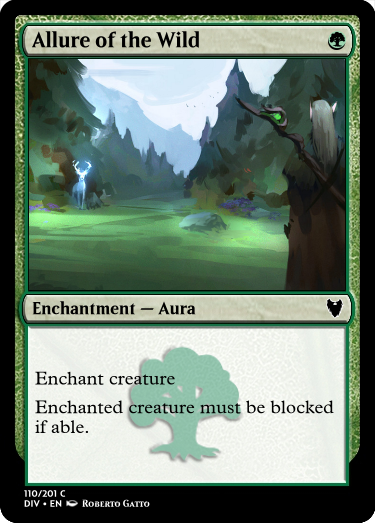 Ambitious Scout: This doesn't look like "mythic" to me. Just a powercreep. You could at least make it legendary. 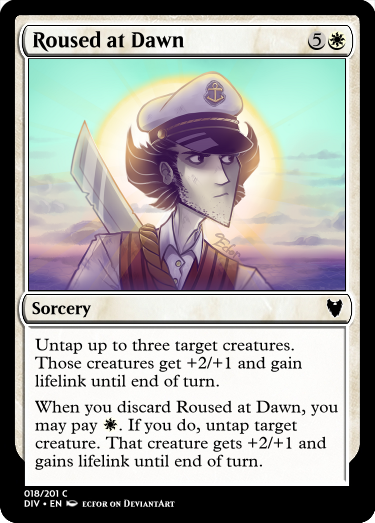 Praise: I find that second ability questionable since it doesn't place any restrictions on the colors of the deck that would play this. 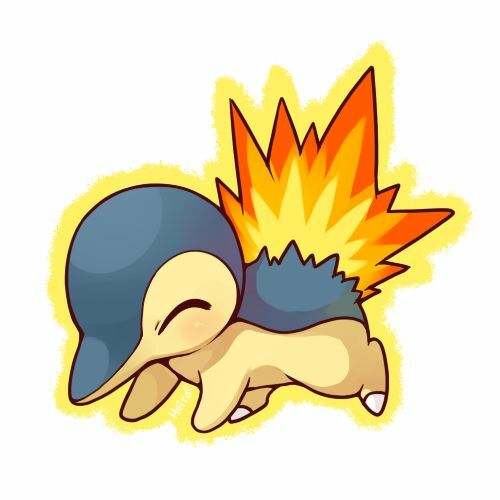 Mandrake: Tapping opponents' stuff isn't really part of green's pie. 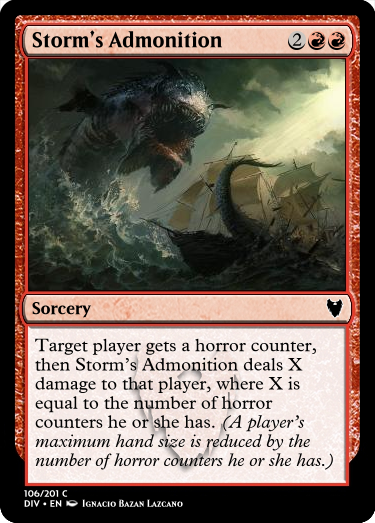 Magmatic Serpent: I would expect this to be a lot larger given the art. It looks like a pretty standard Serpent to me with red fins - I don't get why it wouldn't be blue. I don't see any "magma" going on in the art. Tree Spider: Dude, what's this? 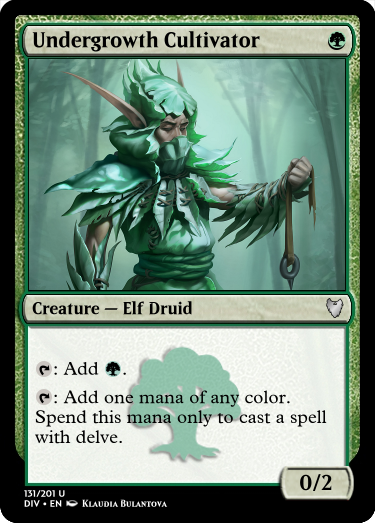 Green, the best creature color, gets a 1/1 vanilla for 1. These days colorless gets 1/2s with a bonus for 1. Salt's Convoy: Art doesn't explain the flying ability. 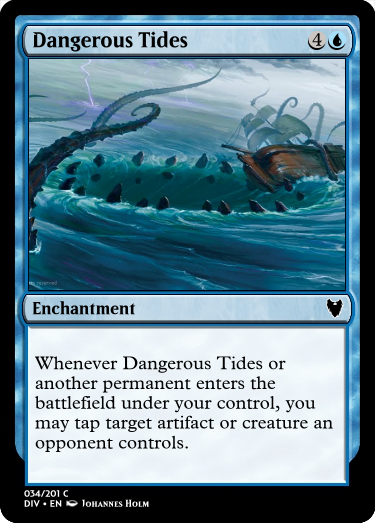 Dangerous Tides: A very interesting card - especially at common. Due Diligence: Seems like a build-around uncommon to me. You don't even want to get too many of these in a draft since they don't stack. Maxwell’s Machinations: This win-con seems too easy to fullfil. Stuff like Manipulate Fate, Selective Memory, and Paradigm Shift exist. 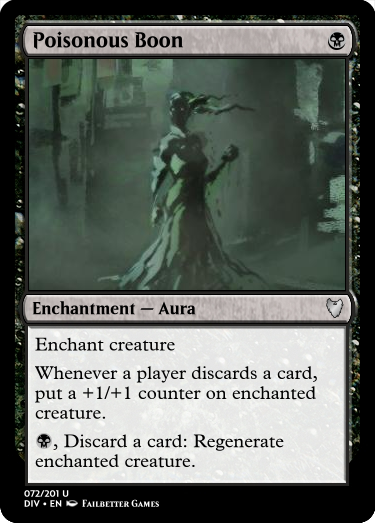 Scrap Heap: This too looks like a build-around uncommon. It doesn't make sense to me at common. Fierce Rebuttal: Quite close to Logic Knot. Makes one wonder if just reprinting it would do. 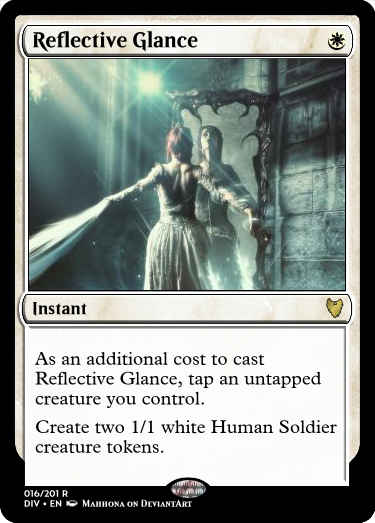 Reflective Glance: Why is this a rare instead of an uncommon? 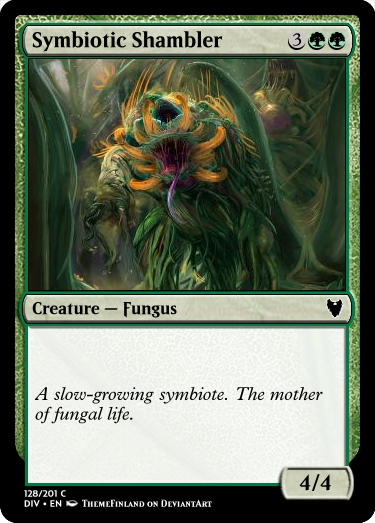 Roar of Growth: Why is this a rare instead of a common? 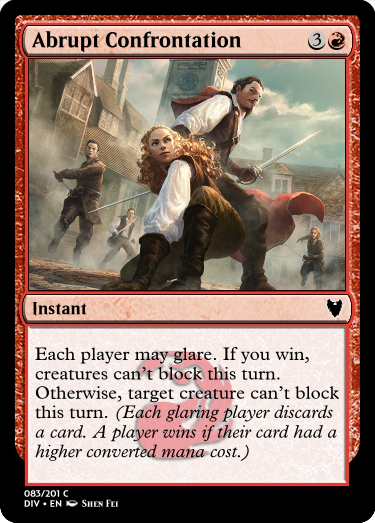 Defensive Tactics & Vision of the Surface: These cards are really bad combat tricks. 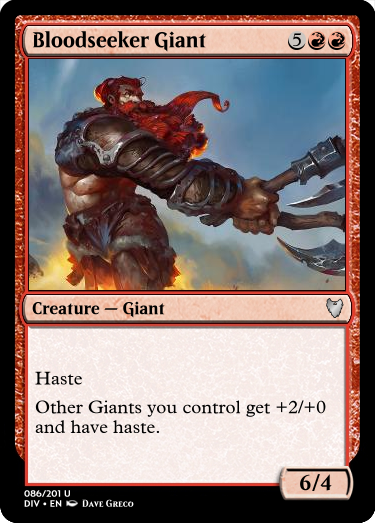 A simple Giant Growth would be so much better. 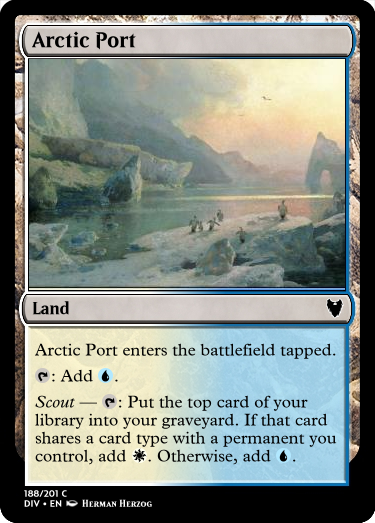 Arctic Port and rest of its cycle: This look too complex for common cards. 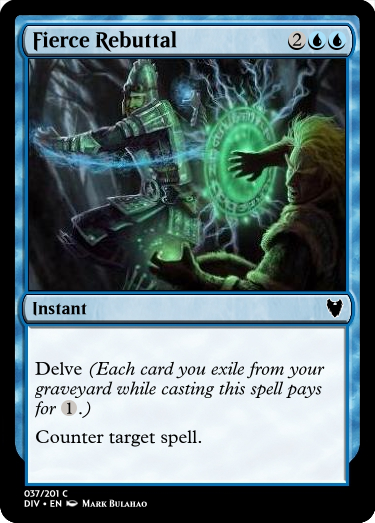 The bonus of milling for one while gaining mana (regardless of the type) seems rather powerful to me. It seems plausible to me that these would make the mere process of planning your turn and paying for your cards a complex ritual. That might consume undesirable large amount of time. 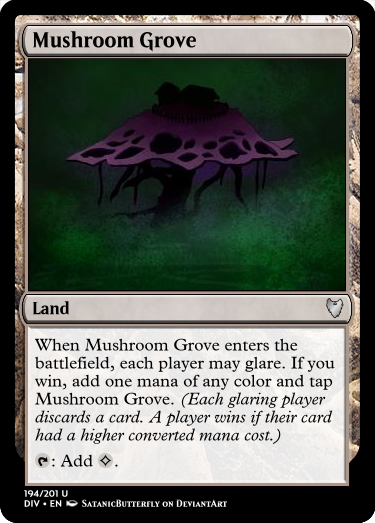 Mushroom Grove: You can still tap this for mana in response to the ability - so you could potentially get two mana out of this the turn it enters. It needs to be worded differently if that isn't intended. 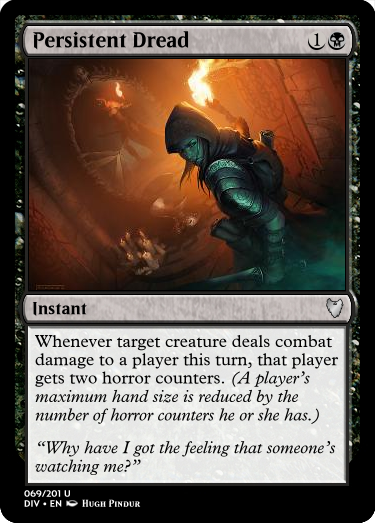 Furious Remembrance: As far as I know, the timing of the glaring part doesn't work when it comes to preventing being countered. 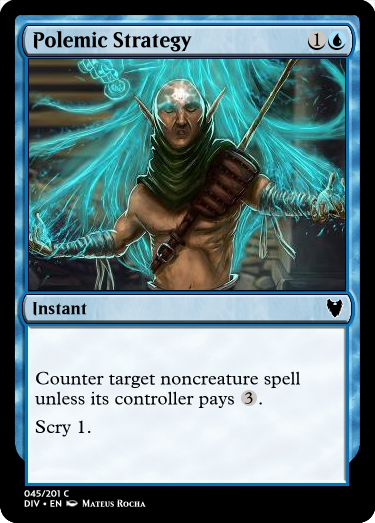 Spells are countered before they begin resolving so the glaring part never comes to play there. Inordinate Cultivation: Any land? Bonkers. Makes me think of Crop Rotation though it's quite different. Salt's Mercy: I would take at least 2 generic mana off that mana cost. 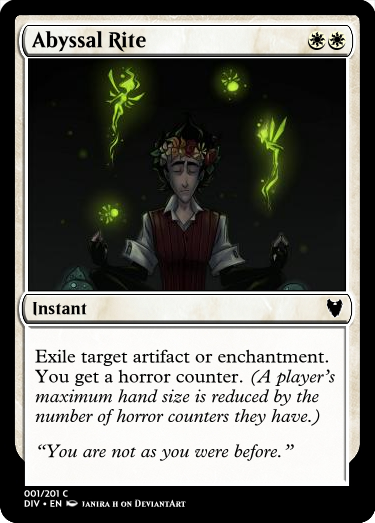 Giving horror counters would be a weird thing for white to do. 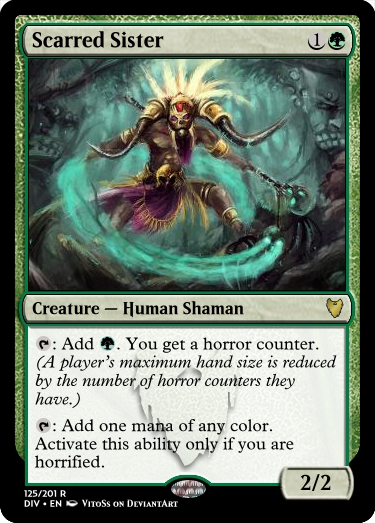 Maybe make it target only you and have it give life thrice the amount of counters? 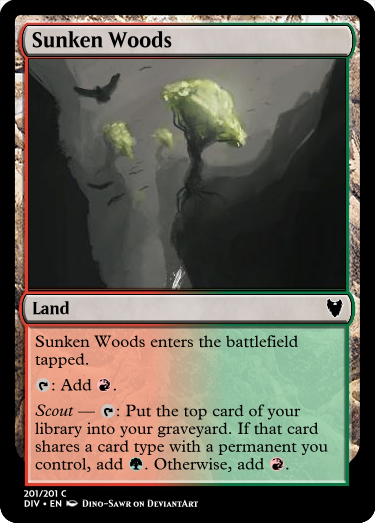 Test of Judgment: How is this playable at all? The Master held his palms aloft. "Behold my wounds," said He. The onlookers observed the cauterization and the sunlight that shone through His great hands... "Let there be pain." Tahazzar thanks for taking the time to go through the set and make comments, much appreciated! I understand now that some cards are off-rarity; this happened because I was designing fillers based on what rarities were needed in the skeleton using the effects the set lacked. I can understand the sentiment but I don't feel like any of these are urgent enough to warrant a rarity shift right now. 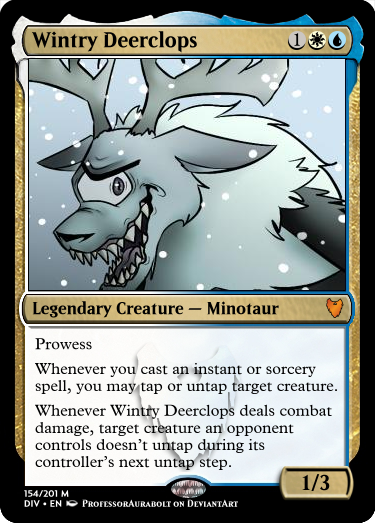 About the power level comments: Yeah, I know, there are objectively bad cards in here. I felt bad making them but I feel like a set's gotta have 'em. No need to be overly dramatic. About the color pie comments: You have a point. However due to the flavor of these cards I judged them more to be color bending rather than breaking entirely. Thanks for pointing out the more powerful ones - I had worried in the past about Inordinate Cultivation and now that someone else mentioned it I can understand its absurdity. Thermal Stone used to be a whole lot more powerful so I'm comfortable with it as after kneading it through playtesting. 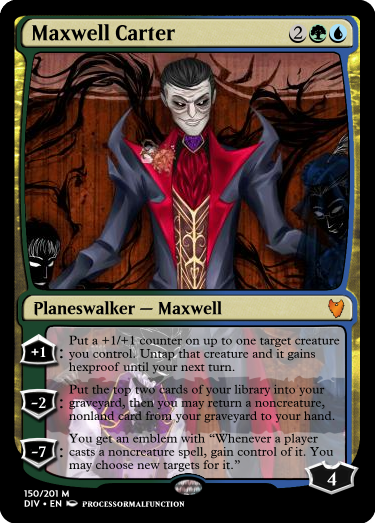 Also Maxwell's Machinations wasn't that much of a deal in playtesting but I can understand how it could be abused in the right deck. Test of Judgment: I... don't have an excuse. It is unplayable as is and I feel like I ought to have caught it but must have slipped through. Luminescent Dolphin is now a Dolphin. Mushroom Grove's wording now says "As ~ enters the battlefield, each player may glare. 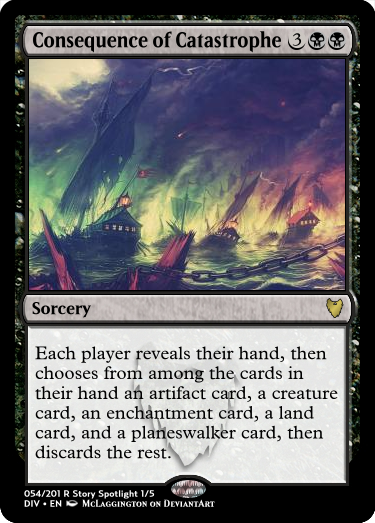 If you win, add one mana of any color and ~ enters the battlefield tapped." 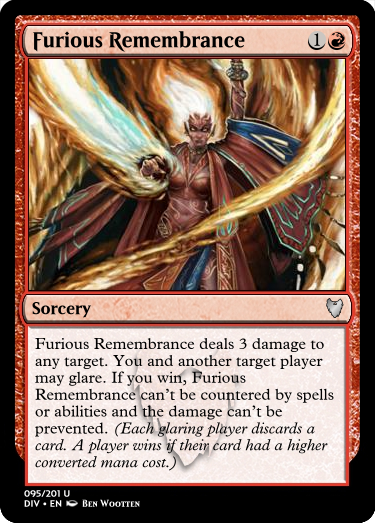 Furious Remembrance now reads "As you cast ~, you and target opponent may glare. 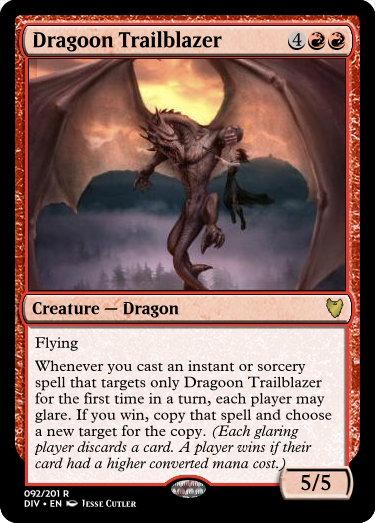 If you win, ~ can’t be countered by spells or abilities and the damage can’t be prevented." 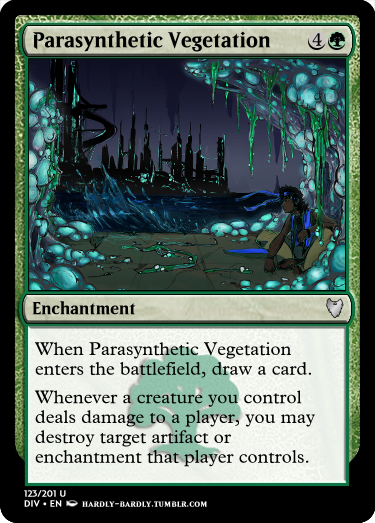 Inordinate Cultivation now searches for basic lands. Salt's Mercy now gains life equal to three times the number of horror counters. 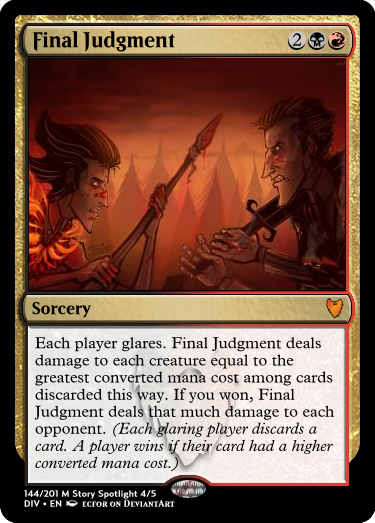 Test of Judgment now drains for 4 if you win and for 2 if you lose. Okay, I have some makeshift fixing suggestions. 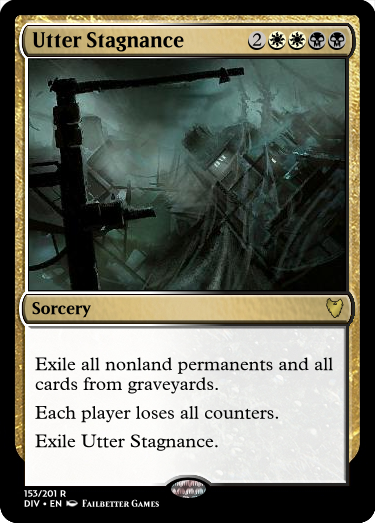 Shadow Manipulator: You could make this exile the nonland permanent instead unless there is some kind of sac theme going on specifically. 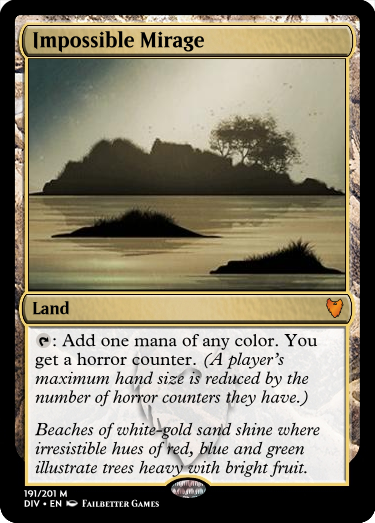 The nonland restriction doesn't seem necessary at all since lands don't have costs and can't be cast anyway. The rarity distribution is a bit iffy. 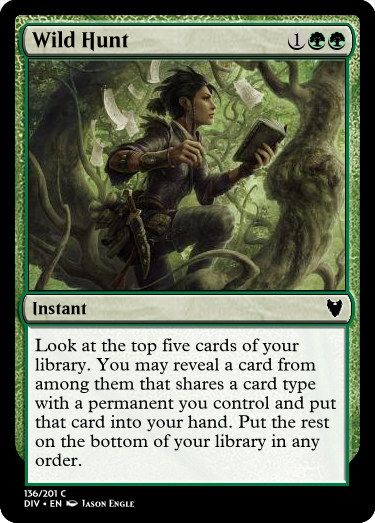 Why are there two mono-green mythics, but just a single mono-colored mythic of each other color? 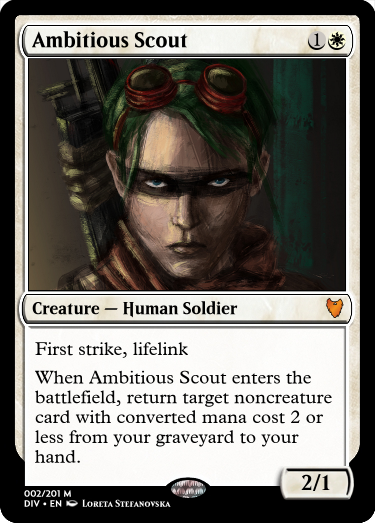 Ambitious Scout: Even your own card notes says this is a 2CMC rare. I would have it switch places with Praise. I would remove lifelink from Scout because it's enough of a powercreep already. Mythic makes more sense for Praise IMO since it's an "epic" incarnation with a bonus that can be activate for free almost in any deck. 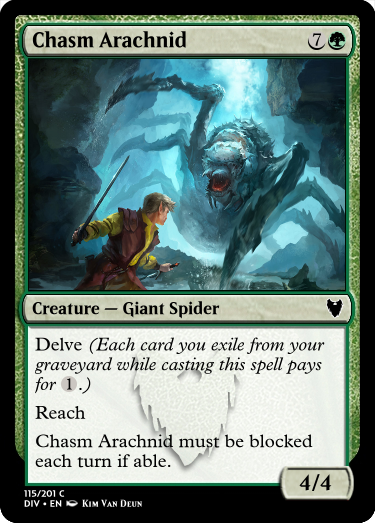 Tree Spider: Give it deathtouch or make it 1/2 reach. Easy fix really. Why would a spider of all things be a vanilla anyway? It's still no Ezuri's Archers. Switching the rarity slots of Due Diligence and Satiation should be easy, right? I don't even get why Satiation is an uncommon. It's essentially a bad Guard Duty. 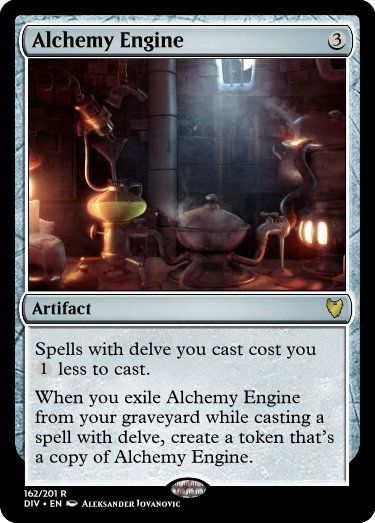 There are hardly reasons to use it on your own creature. It's also very simple and affects only the permanent it's attached to so it has no red-flag concerns either. The two cards share a CMC as well so curve issues couldn't rise from this switch. I would be tempted to switch the rarity slots of Scrap Heap and Poisonous Boom. While Boon will be red-flagged for text length it's at least no Nest of Scarabs and doesn't generate card advantage. IMO it's quite tame power level wise. 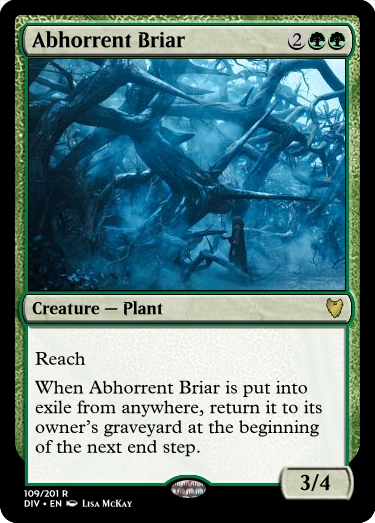 Roar of Growth really should be a common. 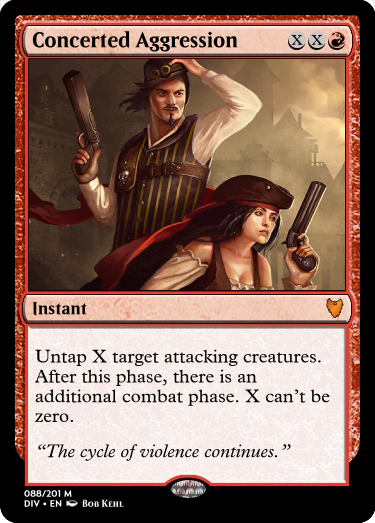 I would move Defensive Tactics from uncommon to rare and have it read "Until end of turn, any number of target creatures assign combat damage equal to their toughness rather than power." 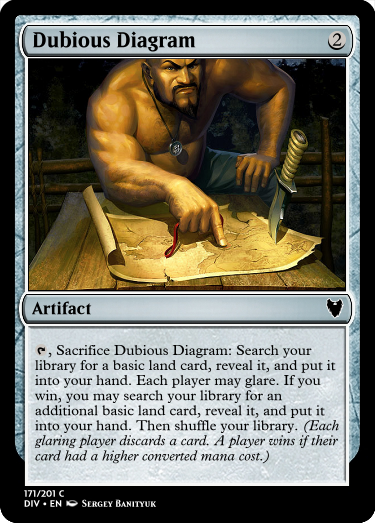 Then, I would move Vision of the Surface to uncommon and add "Draw a card" as a new line of text to its rules text at the very end. 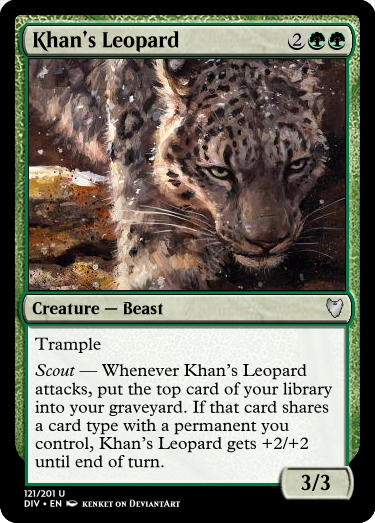 This would now make it so that Roar has a slot to be at common.